Opening times Mon–Wed 11.30am–10pm; Thu–Sat 11.30am–11pm; Sun 1–9pm. Bar open Mon–Wed 11.30am–10pm; Thu–Sat 11.30am–11pm; Sun 1–9pm. Food served Mon–Wed 11.30am–10pm; Thu–Sat 11.30am–11pm; Sun 1–9pm. 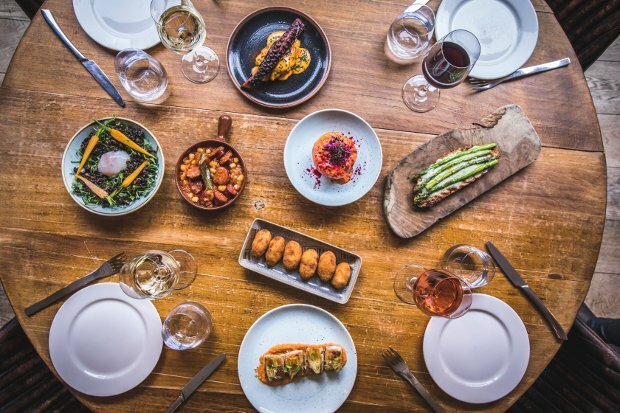 Part of a small chain of restaurants with branches in London, Leeds and Manchester, Ibérica opened in Glasgow in 2016, and is a thoroughly stylish place to dine in the city centre. Decorated with vintage maps, tiles and elegant pink and grey chairs, Ibérica's seasonal menus are designed by Michelin-starred executive chef Nacho Manzano and consist mostly of nicely proportioned tapas. Try the trio of chorizos – smoky, spicy and 100 per cent Ibérico pork – or the tender twice-cooked lamb with marinated cherry tomatoes and peppers. There are some interesting fish tapas, including salt cod with root vegetable crisps, plus chicken and seafood tapas, for two to four people. The apple and cider tart with rosemary-infused ice-cream is a highlight of the dessert menu, and can be paired with a glass of sweet cider for an extra treat. The drinks list is impressive, with over 50 different wines (the top price of a bottle being £650) with most available by the glass as well as by porrón (a 500ml glass pitcher), plus craft gins, Spanish beers, cocktails and sherry.